Written by a scholar who is a therapist and a psychodiagnostician, this book documents the direct relationship between patient response patterns to a battery of psychological tests, and their subsequent behavior in psychotherapy. 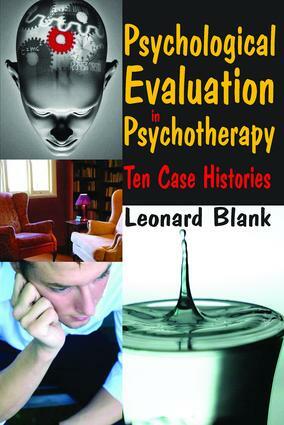 Unlike other books in the field, which concentrate on psychodiagnostics or psychological report writing, Blank takes the reader, session-by-session, through the therapeutic notes of ten patients who were in therapy. At each step of the way, patient behavior in therapy is shown alongside test response patterns.This book, first published in 1965, continues to provide a major contribution, both as a practical manual and as a reference book for clinical psychologists, psychiatrists, social workers, trainees and students. Anyone who is interested in using psychological evaluations to better understand the intricacies of the therapeutic process will fi nd the book an invaluable aid. So also will those who want to sharpen their diagnostic skills as part of theory construction.The author also provides a description and rationale of commonly employed psycho-diagnostic techniques, diagnostic overviews for each of the ten patients emphasizing the dynamics of differing diagnostic patterns and their prognostic implications, complete test data and process therapy notes for each of the ten patients, and an analysis of the complex interplay of personality resources of the patient, the personality of the therapist and the fortuitous circumstances that enter into every therapeutic situation.